Nestled between the Atlantic Ocean and Ocean Drive, between 5 Street and 14 Place, Lummus Park has been the backdrop for many television and film scenes. The beachfront park features a playground, public restrooms, paved paths for walking or biking and the 9 Street fitness area, Muscle Beach South Beach. The park also serves as a host to various special events every year, ranging from concerts to marathons and is one of the most popular destinations in Miami Beach. 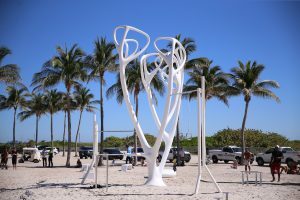 A popular attraction for fitness enthusiasts, Muscle Beach South Beach serves as an outdoor area for exercise, weight lifting and gymnastics, and features two nature-inspired installations: MyEquilibria’s Leopard Tree and MyBeast. These functional structures collectively feature over 30 workout components. 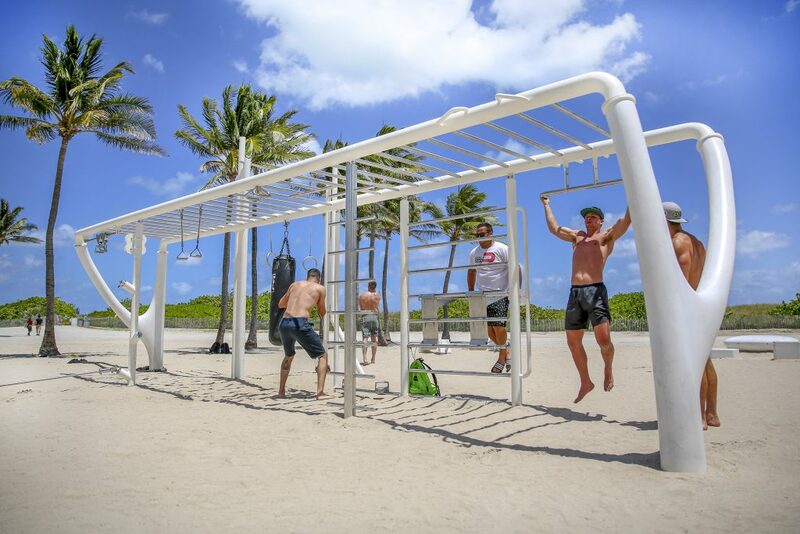 The first of its kind to be featured in a public park in the United States, the installation of this high-end fitness equipment brings art and functionality to the beach and is accessible to visitors and residents alike. With the help of a free mobile phone application, fitness enthusiasts of all skill levels may engage in workouts through a series of available trainings and tutorials. Other improvements at Lummus Park include 114 new dimmable LED lighting, which provide direct light to improve visibility while reducing the amount of light visible from the beach. The lighting retrofits serve as a long-term strategy for better protecting our native sea turtle population by substantially reducing light pollution in the areas with the highest disorientation incidents during the sea turtle season. As the city continues planning, designing and constructing projects along the beachfront, sea turtle friendly fixtures will replace existing lights on public property. What are the components of the Leopard Tree installation? What is the size of the Leopard Tree installation? The tree itself is about 25 ft. by 15 ft. and the surrounding fitness stations found in the workout island vary in size. The installation can accommodate up to 23 users. What are the components of the MyBeast installation? What is the size of the MyBeast installation? The MyBeast is about 33 ft. long by 5 1/2 ft. wide and is large enough to accommodate up to 15 users at a time. What material are the installations / rings made out of? The installations are made of UHPC molecular concrete steel. Will the new installations replace all other fitness equipment in that area? The triple pull-up bars, single metal pole and dip bars presently on site will remain a part of the 9th Street fitness circuit. The Leopard Tree and MyBeast installations will replace all other equipment.